To give you a little history, Manise is an 8-year-old girl who first came to St. Damien one year ago. She was diagnosed with Tetralogy of Fallot, a congenital heart defect that required her to be on oxygen 24 hours a day. Unfortunately, this meant that she could not leave the hospital until a life saving surgery could be performed. The necessary operation is complicated and could only be performed outside of Haiti. 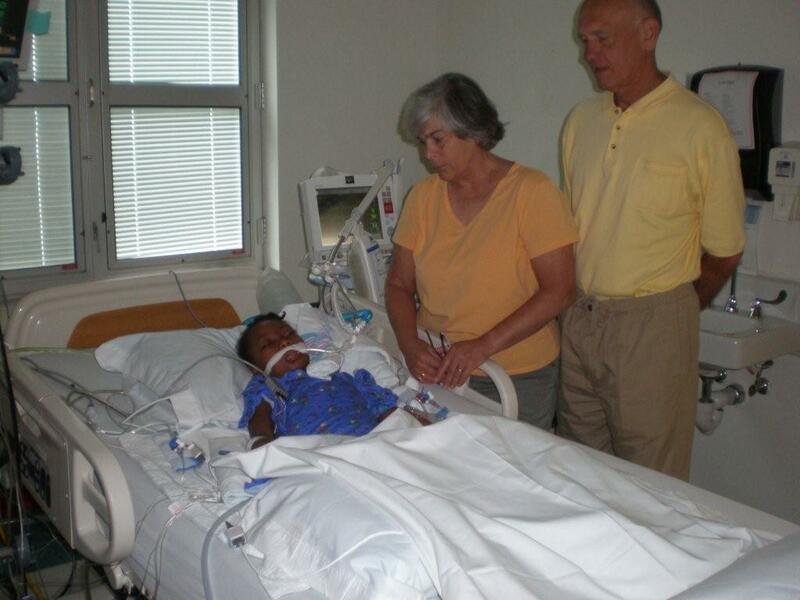 Earlier this summer, through the help of Sister Judy Dohner, St. Damien’s surgical director, Manise was accepted as a Gift of Life Child through the Marco Island Florida Rotary Club and was scheduled to have surgery on October 1st. Little Manise has been blessed by so many generous organizations and individuals who have stepped up to donate what they could. St. Joseph Children’s Hospital in Tampa, Florida where the operation was performed, has donated all their services related to the surgery. The Ronald McDonald House, which is such a strong support system for families all around the US, is hosting Ron and Ronni free of charge while Manise is in the hospital and the condo where Manise will recover has been donated by an anonymous samaritan from Wisconsin. 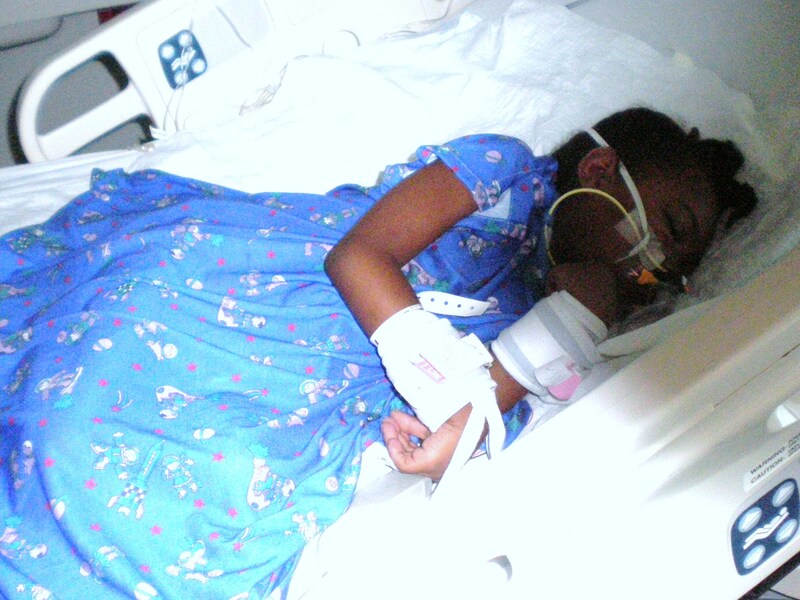 In addition, American Airlines, Naples Oxygen Company and the Miami fire department have all worked together to ensure that Manise has oxygen through her flight and on her way to the hospital. Unfortunately, the day before the surgery, Manise coded once during the insertion of a cardiac catheter then a second time later that evening. The doctors feared that she would not survive the surgery so she was kept in a medically induced coma to save the little strength her heart had left. Manise did have surgery as scheduled and her heart was fully repaired; however she remained in critical condition for many days afterward. Wednesday, we received the good news that Manise was breathing on her own and her heart was strong! She improves every day and could be discharged from the hospital as soon as Monday. She will then stay for four to six weeks in a condo on Marco Island Florida with the St. Damien dental team, Ron and Ronni Pruhs. Ron and Ronni have been coming to Haiti from their home in Wisconsin for over 15 years extracting teeth and filling cavities and have are now generously donating their time to care for Manise while she recovers from the operation. We are so grateful that this little girl will finally have a chance at a healthy life. It is only through many generous people, however, that the surgery was a success. St. Damien Hospital and Manise’s family extend our sincere gratitude to everyone mentioned above as well as the dozens of other contributors who made this operation a success.